Martial to leave Manchester United this summer? 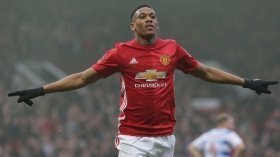 Manchester United head coach Jose Mourinho has reportedly given the go-ahead for Anthony Martial to pursue a fresh challenge away from Old Trafford in the summer. The France international has dropped down the pecking order at Old Trafford since Alexis Sanchez's arrival and he has managed just four league starts since the start of February. According to Tuttosport, Mourinho has now given the green light for Martial's exit with Juventus supposedly leading the pursuit of the former Monaco man. Premier League rivals Chelsea are also understood to be in the running for the Frenchman with reports emerging that they could discuss a part-exchange involving Willian as a makeweight. Martial joined the Red Devils from AS Monaco in the summer of 2015 and he has since managed 36 goals in nearly 140 appearances for the club. He has mainly featured on the left-wing where Sanchez is now the first choice.